A slight bruising of the crotch | Scots Whay Hae! There are works of art that you carry with you, that make you look at life in a different way and hold a significance beyond simply enjoyment or appreciation. A few personal examples would be A Walk Across the Rooftops and Hats by The Blue Nile, the 1981 film Gregory’s Girl and James Kelman’s The Busconductor Hines. 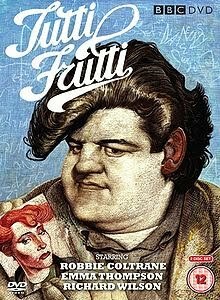 Another would be John Byrne’s Tutti Frutti, a six-part drama which was first shown in the Spring of 1987 and has just been released on DVD for the first time. It is rare, especially in terms of modern television, that one-man’s vision arrives on screen so fully formed. Alan Clarke, Denis Potter and, more recently, Stephen Poliakoff are exceptions that come to mind. In Scottish television I can think of only one that stands comparison and that is John Byrne. Byrne not only wrote the script he provided artwork for the titles and the accompanying BBC book, and his vision is in every detail. He also had the power to insist that Robbie Coltrane was the only choice to play leading man Danny McGlone (as well as his deceased older brother ‘Big Jazza’). The casting of Coltrane is worth considering. It would seem unlikely that a man of his physical stature would ever be considered as a romantic lead. Those who have seen Tutti Frutti and are aware of the chemistry between Coltrane and his leading lady Emma Thompson will realise how short sighted such a view would be. Coltrane’s performance is perfect leading man material, but, with the exception perhaps of Cracker, his subsequent career shows how unusual this role was.Without wishing to labour the point, consider the curiously well reviewed recent rom-com Gavin and Stacey, which persists with the all too common casting of the ‘overweight’ characters as the funny friends/sidekicks. James Corden and Ruth Jones fulfil the stereotypical role of Falstaffian comic relief, which is doubly frustrating as they wrote it! Byrne was not afraid to take risks with his characters. Tutti Frutti contains wonderfully realised, if flawed, human beings. This particularly applies to the men, which admittedly is nothing new, but the rogues gallery that includes Richard Wilson’s deluded, suave, conman ‘Eddie Clockerty’, Stuart McGugan’s short fused and misogynist drummer ‘Bomba Macateer’ and Maurice Roeves’ aging, pathetic, lothario ‘Vincent Diver’ are characters without being caricatures. Byrne manages to extract comedy and pathos, often simultaneously, in these performances. Do not mistake this for romantic comedy, it is drama in its truest sense, and Byrne’s dark side is always present to stop the audience from settling. It would be remiss of me not to mention the female characters who are equally well drawn. Emma Thompson has never been better and her ‘Suzie Kettles’ is the perfect counterpoint to Coltrane’s ‘Danny’, both of them making what is an unlikely love story completely believable. Kate Murphy as the gallus, cultured and smart mouthed ‘Janice Toner’ is perhaps the standout performance against stiff and lauded opposition. The real drama is to be found in two characters who are secondary in terms of billing. Vincent’s two women; the tragic girlfriend ‘Glenna’ and his long suffering wife ‘Noreen’, may not get the screen time of other characters but their story is where the heart of the drama is found. As with previous Byrne scripts such as The Slab Boys the comedy and knockabout may get your attention, but it’s the tragedy and pathos that stay after the credits roll. Byrne’s real genius is to be found in the scripts. His ear for the unusual in everyday language makes the drama sparkle as he manages to have his characters speak in a way that is recognisable to his audience, but much more interesting and lyrical than they could ever be. The influence of the fast-talking, wise-cracking, American cinema of his youth is obvious and fits the West of Scotland obsession with all things USA, particularly in the 1980’s where you couldn’t move for Rockabilly bands busking on Buchanan Street, and ‘Diners’ opening on every corner. The accents may have been Glaswegian, but the haircuts and patter told of dreams of Eddie Cochran or Jimmy Dean. Byrne wasn’t mocking such obsession, he was part of it. Tutti Frutti is a love letter to the music, films, people and places of his youth and it is the complete understanding of the world he creates that persuades the audience that they want to be part of it. Tutti Frutti managed to both influence and overshadow Scottish TV drama. Byrne’s own Your Cheatin’ Heart and Donna Franceschild’s Takin’ Over the Asylum were personal favourites but no Scottish drama held the same magic as this tale of an aging rock and roll band and the oddest couple since Walter and Jack moved in together. It has been unavailable for so long that many people began to doubt it ever existed. I had that terrible fear as I sat down to watch it 20 years on that I was going to be disappointed and have some wonderful memories ruined. I need not have worried. To those who have never seen this I recommend with all my heart. Those who have will understand. Pingback: Scots Whay Hae! Presents… Hugh Kearns’ & ‘Festival Tent’. | Scots Whay Hae!